Sweet spring, you are within sight! The start of Daylight Savings time in the U.S. is only 31 days away from the date this post is being published. Thirty-one days! I can manage 31 days of time until the sun stays out an hour later. I can eat my pretty Fennel, Cranberry, and Mint Kale Salad with Orange Honey Vinaigrette and dream about those warming rays kissing my face and making the flowers grow and unfurling the leaves on the trees and being generally AMAZING! I’m pretty psyched for warm weather and increased daylight, to say the least. It’s my jam. But for now, I am grateful for all of the little pleasures in my life that make this time of year bearable. I am determined to see February as delightful and to appreciate it for what it is, because it is wonderful, just in more subtle ways than the warmer months. Getting back to the recipe, I must say that I enjoy using kale in salads because it’s a sturdy green that holds up well to dressings. I like that I can pack a kale salad for lunch the night before with the dressing tossed in and not have it be all soggy when I go to eat it. That being said, kale can come off as tough and bitter. 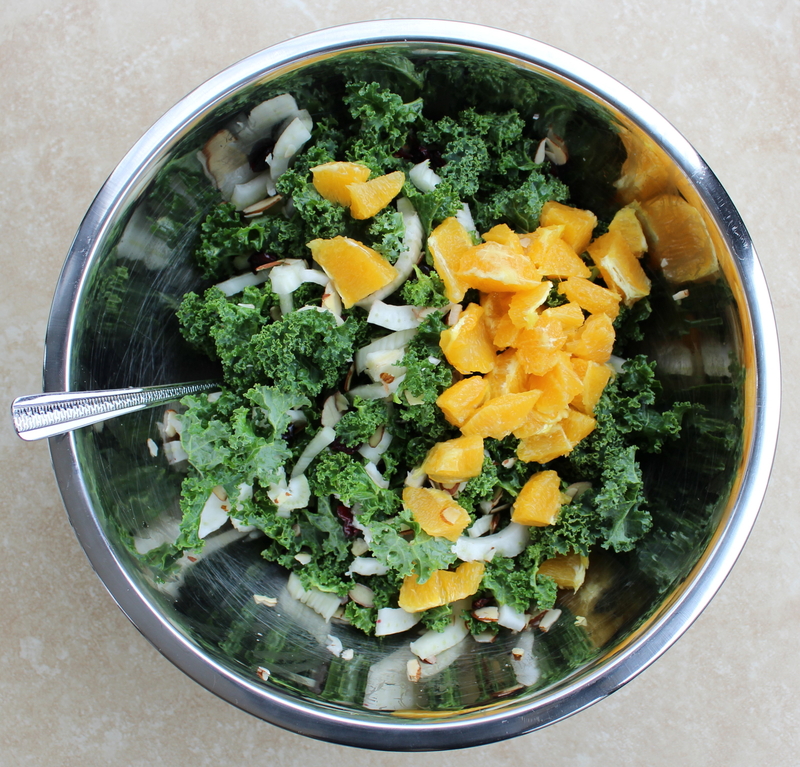 To ease that, you can massage your kale before tossing it with the other ingredients. Drizzle a little olive oil onto the kale and knead it in your hands for a few minutes. The leaves should soften, become darker in color, and taste less bitter. Another thing I love about kale? It’s packed full of beneficial vitamins and minerals such as calcium, vitamins A, C, and K, and copper, which I learned from this extensive article from the HealthyLine blog titled “26 Science-Backed Health Benefits of Kale.” Check it out; it’s incredibly informative and will give you even more reason to make this Fennel, Cranberry, and Mint Kale Salad with Orange Honey Vinaigrette! Another benefit I discovered from making this salad is that it helped me to hone my knife-wielding skills! I finally learned how to slice oranges into pretty, pith-free segments. This post from The Kitchn showed me how. OK, on to the recipe and enjoying the simple pleasures of February! 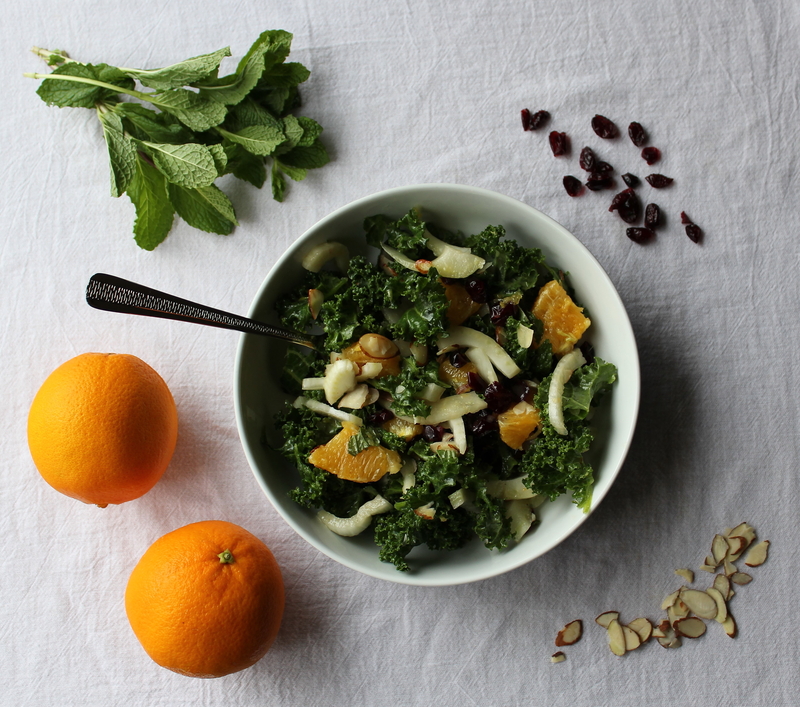 In a large bowl, toss the kale, fennel, orange segments, cranberries, almonds, and mint. To a Mason jar or similar such container with a lid, add the vinaigrette ingredients and shake vigorously until well combined. Pour over the salad and toss it to distribute dressing evenly. And you’re done! Makes about four servings.